I’m hearing that parts of the country are already getting snow not measured in inches but in feet! When I hear this, my mind wanders back to the days that I lived in Western NY and I remember how beautiful it was but also what a pain the neck it was! I also remember that it was the time I worried most about “my” backyard birds. I felt like they’d never survive without my feeding and providing shelter for them. That of course is nonsense as mother nature provides everything birds need to survive the winter. My providing for them just helps ME to be able to enjoy their presence year round. 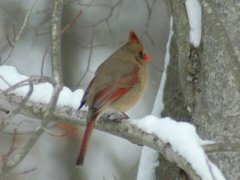 You almost can’t beat the simple beauty of seeing a red Cardinal or a Blue Jay in a snow covered backyard. It’s simply spectacular! 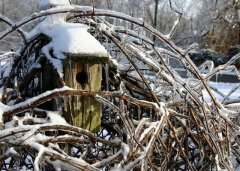 If you want to see birds in your backyard during winter, just provide for their 3 basic needs. Food, Water, and Shelter. It’s that simple. This brings me to the months issue of Birds and Blooms magazine. Anyone who knows me know that I love this magazine! This months issue was so full of craft ideas and beautiful winter wonderland photographs that I just couldn’t put it down! I wish I had a copy to give to every one of you! I found so many ideas this month I couldn’t help myself but to share it with you. 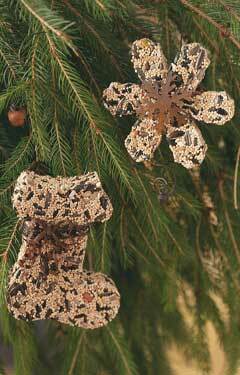 This month on their website they are sharing how to make birdseed ornaments with just a few ingredients and some cookie cutters. Another idea and a very inexpensive way to feed your feathered friends that they mentioned was to attach dried corn cobs to tree limbs. This will be especially attractive to Blue Jays! When the corn is gone you can spread peanut butter on the cob and roll it in birdseed for an extra treat. 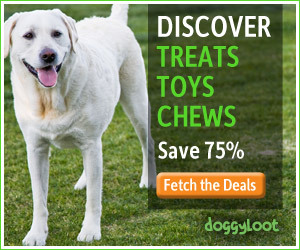 (a very inexpensive way to feed.) Whether you are a subscriber or not, their website is a really great resource for anyone who loves gardening or birding and I highly recommend that you visit the site here. With a few simple tasks you can enjoy year round birds in your backyard.